Chamber larp is another term for short larp just as black box larp and Grenselandet – Oslo Chamber Larp Festival, was held for the 4th time during 25-26th October 2013. It was organized by the Norwegian organization Fantasiforbundet. About 115 participants from 13 countries attended. For me it was the third time I had the possibility to visit this great event. If you speak Norwegian you can listen to Martin Andreasen talk about the festival back in 2010 here at my first Grenselandet. There were more than 20 larps available to play. I hosted one and attended two others. Papers is a larp fast-paced short larp designed by me and Martin Martin Rother-Schirren. It was written during the spring of 2013 and has been held at Knutepunkt 2013, The Larpwriter Summer School, Sweden Social Web Camp, in Malmö and at the Minsk Street Theatre Festival. During this run which me and Martin hosted we had almost 40 participants who went “From Good to Great”. We are very happy how it went and we will in near future release the full larp script online. The Paladin-coach motivating the adventurers before the soon to be failed dungeon-crawl. Hirelings which is a humorous classic fantasy adventure parody with a Paladin coach and a therapy session after a failed dungeon raid. Written by Håken Lid and Ole Peder Giæver. Playing it as the first larp on Saturday was a great start of the day. It is really great with larps that just deliver a joyful and fun experience. Sarabande is was a fantastic larp set in a bohemian 1890’s cafe in Paris. The interesting part of it is that all the communication is done with some sort of artistic expression. This could be theatrical speech, reading a poem, writing down a letter, painting, dancing or in many other ways. The larp had a great set of workshops which really took care of the participants and made it very clear we were going to play out something in a completely new way. Thanks to Maria Bergmann Hamming and Jeppe Bergmann Hamming for writing and hosting one of the best larps I have played this year. It blew my mind a bit and was right up my alley. If you have the possibility, don’t miss this larp. During the Friday, Fantasiforbundet celebrated it’s 4th birthday. Part from Grenselandet it also has also organized the larp Till Death do us Part in Palestine and the Larpwriter Summer School. Many really great things has come from my favorite Norwegian organization and I am very sure many more will. During the fall an Indiegogo-campaign was held for the Larp Factory Book Project. An initiative to document and collect 23 larpscripts and make it into a book. The Saturday of the festival held it’s release party and the book is now printed and available. I am amazed by the great work by the editors Trine, Elin, Lizzie and all the 70 people who in one way or another made the project a reality. Norway is really rockin’ right now. I asked the main organizer why Fantasiforbundet organizes Grenselandet and what he thinks the festival has become now after 4 years. Fantasiforbundets is above all an organization that strives to strengthen the community, to create meeting places and promote mobility. Grenselandet started up in 2010, one year after the creation of Fantasiforbundet. It was no strategic decision back then. 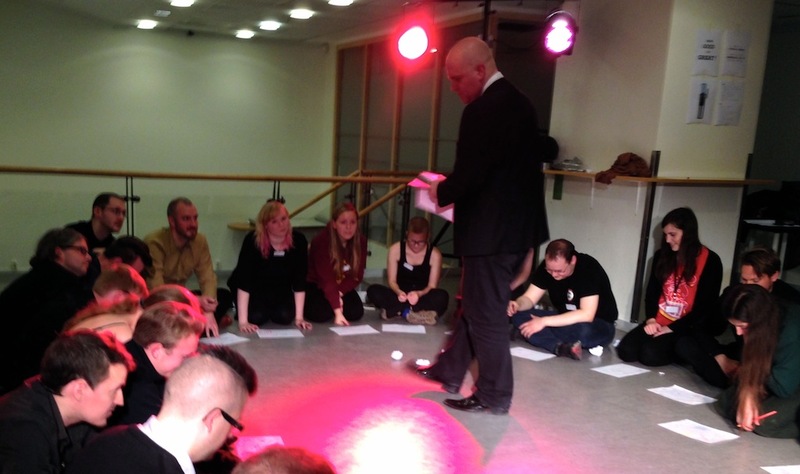 The festival was a result of the merger of a Larp Factory event on Swedish tape-larp with the playtesting of the finalists in the Nordic Larpwriter Challenge, a competition on writing educational larps for use in Belarus. This gave birth to the first Grenselandet, a festival with six larps on the programme. Grenselandet was from the start a city festival, but with a strong social focus, including the community in Oslo opening their homes to international participants. Already from the 2nd year, Grenselandet had a majority of the programme items in English. Since then, Grenselandet has been a truely international meeting place. But increasingly, the festival has also become an important arena to interlink the various projects Fantasiforbundet have internationally. This year, most notably the Larp Exchange Academy, The Larpwriter Summerschool and The Larporatory, where five of the larps on the programme were created. We believe that making people meet across borders can be our little contribution to a better world. We believe in the right to creativity and cultural participation, and that larp can be a liberating tool. We do not think we can do something for everyone, but we can do something for someone. And contrary to most other organizations we don’t believe in the national level as a natural framework for our work, but rather believe in working on the local level and the international level. Through our different projects, including Grenselandet, Fantasiforbundet has made possible several hundreds of larp-related trips throughout Europe and the Middle East possible, many of them for people who could otherwise not afford to go. The majority of these trips have been for people who are neither Norwegian nor members of Fantasiforbundet. Grenselandet is of course still a meeting place for the small chamberlarp community in Oslo. But in addition, through the four Grenselandet festivals we have organized, we believe Grenselandet has developed into being a hub for the international cooperation we aim to promote – A place where we can showcase some of the results achieved, and where wonderful people can meet and forge new ideas. Socially it’s always nice to meet so many old and new friends from all over the world. I don’t know exactly how many nationalities were represented, but I counted French, Lithuanian, Swedish, Danish, Norwegian, Polish, American and more. It’s such a boon that we’re able to get together and share both experiences and insights. That way we can learn from each other’s gaming cultures.